Officially recognized in 2018 as a sub-appellation, vineyards stretch northwards along the East Bench of Skaha Lake and across the water to Kaleden, then South over rolling hills above Vaseux Lake with Okanagan Falls at the heart. From award winning sparkling wines, crisp Rieslings, aromatic Gewürztraminers to complex Pinots, rich, bold Syrahs and juicy Cabernet Sauvignons, there is truly an exceptional wine for everyone. All wines tastings, taxes and gratuities are included. It’s a place unlike any other. 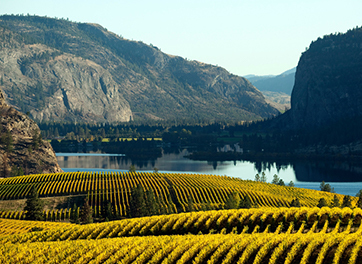 From vineyards to orchards, Okanagan Falls is one of Canada’s prime agricultural areas. With its dramatic landscapes, and remarkable terroir, this is one of the most beautiful and diverse places to visit. In Okanagan Falls you'll find grape growers and winemakers united in a common vision: to grow fruit and make wines reflective of the distinct South Okanagan character. Make your own discovery. Uncork the sun. Come tour Okanagan Falls Wine Region with us. With Okanagan Falls at its heart, vineyards stretch Northwards along the East Bench of Skaha Lake and across the water to Kaleden and then South over rolling hills above Vaseux Lake. Over tens of thousands of years a series of glaciers, up to 3 kilometres thick, carved a great valley out the of mountains that we now call the Okanagan. In places it is deeper than the Grand Canyon. The retreating ice mass left behind long benches of fertile soil and a series of spectacular lakes. Our region of the South Okanagan is a unique climatic zone known as a semi-arid steppe, the final stage of a desert area that extends up from the United States. Along with that comes long warm days and cool nights that retain the acidity in the grapes and helps shape their distinctive character and flavours.